I have received my first supplies of the new Walsall booklets containing Machin definitives with security features. Some have cylinder numbers, some don't so I'll only be able to report what I have. The phosphor bands seem to be more or less accurately aligned on all booklets. As reported before, the 1st class letter stamp was first issued on 10 March in the Design Classics retail book (with the red cover). Used examples may be distinguished from the current book in two ways. The new booklets have flat-topped perforations; the Design Classics booklet has rounded tops to perforations. As previously mentioned on the Walsall printings the security cut is actually 4 cuts, compared with De La Rue's two cuts. On the latest (31 March) booklets the gap at the apex of the curve is wider than on the Design Classics (10 March) booklets. Correction: The current (31 March) booklets have a wide gap on the 1st & 2nd books of 12, and a narrow gap on the 1st book of 6 and the Large Letter books. Of course we don't know at this stage whether these distinguishing features will be consistent, but at least it gives us something to look for on used stamps. 31 March Cylinder Blocks - of 6, and not self-adhesive! Despite apparent evidence to the contrary we can confirm that the Machin definitive and country definitive stamps are printed in sheets of 200 on conventionally-gummed paper, and have cylinder numbers adjacent to row 18 as they always have been. For speed and space I have only scanned one of each - apart from the position of the 'blob' in the grid (can two squares be a grid?) - all the sheets are the same, the number of cylinders being the same as in previous years. My factory-sealed packet of 50 booklets contained none with cylinder numbers, so I assumed that there were none on these booklets. However, a friend received two from the Philatelic Bureau, and both had cylinder numbers (W1 repeated) below the routemaster stamp. Distribution seems, therefore, to be haphazard! 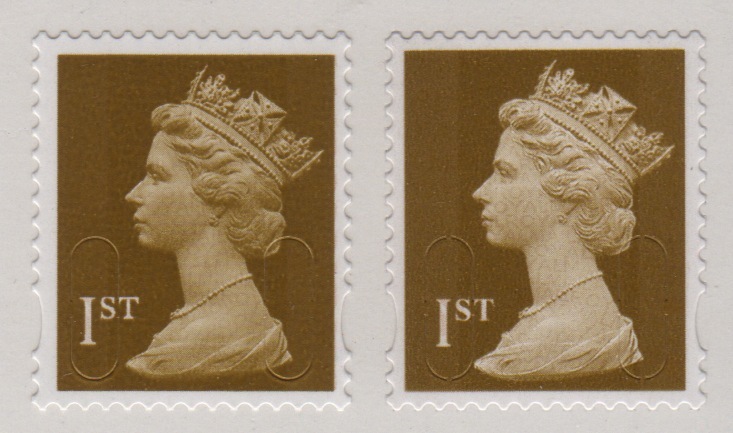 Originally scheduled for issue on 17 February, the booklets and business sheets were delayed, and Royal Mail philatelic announced that the "official first day of availability" would be 31 March, the same as the stamps for the new postage rates. This overlooked the fact that the Design Classics retail book issued on 10 March would also have security features on the definitives, thus making that date the first day of issue of Walsall printings, of the 1st class at least. It is now apparent that the 1st class books of 6 were available in some retail outlets as early as 9 March, as we have had two reports. There are no reports of the 2nd class or either Large stamp being available in booklets yet. Collectors will know that the Glorious Northern Ireland Smilers Sheet contained the first self-adhesive 1st class country stamp. 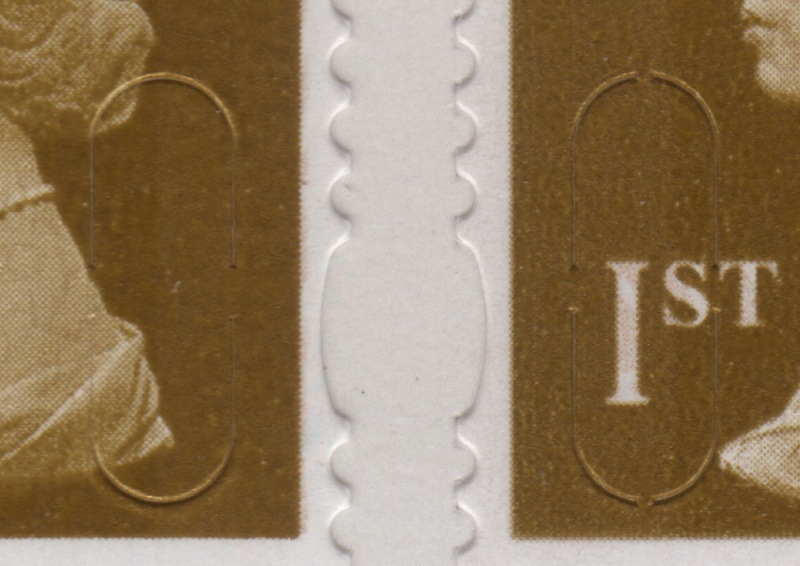 The perforations (die cuts) were 'ordinary' and the phosphor bands fuzzy at the edges. 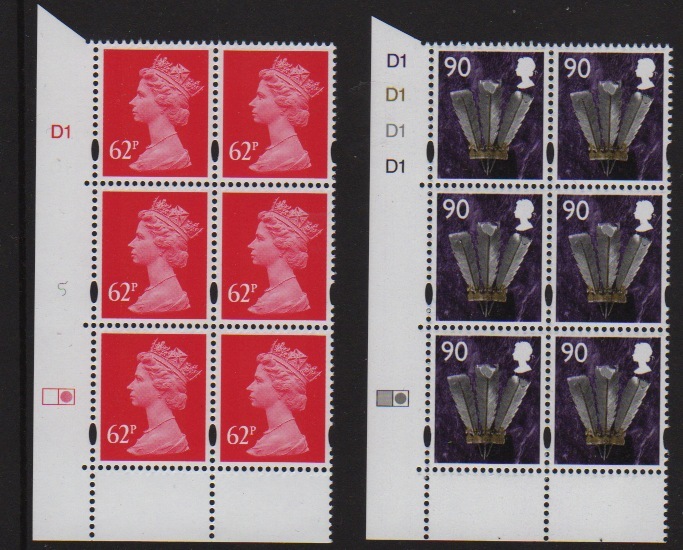 The Glorious United Kingdom Smilers Sheet, containing 1st class stamps from all four countries had elliptical perforations (syncopated, in US) and the phosphor bands were sharp-edged. Now the Castles of Northern Ireland Smilers Sheet combines the two, with elliptical perforations and phosphor bands fuzzy at the edges. So that means the specialist has three different self-adhesive 1st class stamps from Northern Ireland and can look forward to the same from the other three countries. * General - under x10 magnification and using long wave UV, the phosphor looks cross-hatched. * A Man's A Man 1st class - RB clearly inset (by 0.5mm?) from perfs compared to normal copy. * 2nd class Saltire Flag - CB appears to have slipped by <1mm as the phosphor has intruded more onto the 50p Thistle stamp. 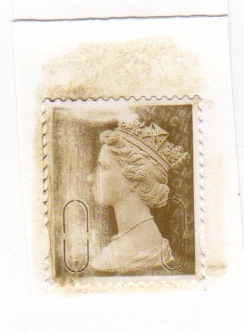 If you removed this stamp from the M/S it would clearly have a thin phosphor line top middle. * The 1st class lion & 81p tartan have the LB shifted slightly left. If you look closely at the lions 'thumb' for want of a better description, the normal phophor stops just to right, while, on the shifted phosphor it stops neatly to the left! giving a slightly narrower LB. The effect on the 81p is the gap between two perfs. * There is also a slightly but clear downward shift of the two bands down the 1st class lion and 81p, with more perf exposed but not quite getting to the stage of a phosphor bar. * The RB of phosphor down the 1st class and 81p is clearly inset left (by 0.5mm?) giving a bar effect down both. * The 1st class portrait has such poor phosphor any effect is lost, however, there appears to be a bright fluor effect just to the left of the perfs on the M/S itself. This is the last Royal Mail special issue produced by Joh Enschede. Mayday - Rescue at Sea stamps won in the Print Design category in the Design Week Awards announced last night. Royal Mail Design team members Marcus James and Catharine Brandy collected the award at the event ceremony at London's Hilton Hotel on 3 March. In the same category more stamps received a special commendation – Lest We Forget stamp issued in 2007 commemorated the 90th anniversary of the Battle of Passchendaele.